Overall the place was ok, but I was told,I would be getting one thing and ended up with something different. The thing I really didn't care for was the way Ms. Elaine talked to me when I was asking her questions. She started going off, telling me she's scarred and I was being rude, but that was not the case, I was just asking her questions, that she wouldn't answer. I also asked her what are you afraid of, was it because I was black? She got very upset. It was not a very professional experience at all. Everyone else was accommodating." What a well kept secret! very nice resort in the middle of Tybee Island. Great accommodations, just a few steps from the ocean." The "3 pools" are 2 kid pools and a 4 foot pool. We got locked out of our room (the 5 digit passcode door did not open all the way) and the front office was "out for the night" so we waited for 45 minutes until we called them back 3 times"
WE HAD NICE ROOMS BUT FLOOR WAS COVERED WITHSAND NOT SWEPT WHEN WE WENT IN, SHOWER HAS MOLD AROUND THE BOTTOM NOT AS CLEAN, EILING FANS WERE VERY DIRTY, I WOULD SUGGEST MORE TOWELS AND BATH CLOTHES FOR THREE DAY STAY WITH SIX PEOPLE IN A ROOM. BEAUTIFUL VIEW,NOT NOISY, EASY TO GET TO SHOPS NICE TO HAVE DINER AT THE PLACE. " The condo was just as described. It was very nice and we loved the light beachy colors. It was very clean. Loved the balcony and view of the pool and beach." Jun 18, 2018 - Staci S.
Very inconvenient, few things were as they were described by the rental agent. Would not recommend to persons with physical disabilities, especially using wheelchairs. Elevator was painted without warning of wet paint, and yes all parties had clothes with paint on them. Then same day the flooring was replaced in the elevator and it was out of commission for the remainder of that day. The physical needs of some in our party was very inconvenienced. The accessible route to the pool was blocked for two days while work was completed on the restaurant, that the agency failed to share it wasn't open until Wednesday's during normal business. Without warning a maintenance worker sprayed the narrow walkway while our party was preparing to exit the building. Apologies were offered by the office staff but responsibilities were directed toward the rental agent. Several areas in the property was damaged and could have been unsafe. The sliding door to the balcony had no lock and was not attached to the door facing. It was on the second floor so I suppose no one could or would be expected to scale the wall. The other areas of the condo was nice but didn't appear to have been mopped anytime recently. Too much money for what was offered. More walking than physical disabilities, that were shared with the agency, could manage without more than average supports. The rental agency was very unprofessional by having little to no knowledge about the properties." We were only at this Resort for one night, but have to say it was exceptional; super nice!" The condo was very nice, close to the beach & the pool, we enjoyed it very much. Biggest complaint was the condo floor was extremely dirty. We actually bought cleaning supplies & cleaned it ourselves. Our feet were so dirty from walking around that they were almost black even straight out of the shower. Otherwise it was a nice place to stay. " We stayed at this location 10 years ago and had a wonderful stay . This tie the particular condo we had needed some work on it . Several things needed fixing . The condo we stayed in ten years ago was perfect . Difference in owner care I guess ?? We couldnt get the sliding door to open easily , the bathroom sliding door would not open back and forth , the furniture needs to be replaced , the floors around the baseboard were very dusty , the ceiling fan in the second bedroom vibrated so much you culd not use it , the kitchen pots pans and dished need to be replaced . I will say the beds slept very comfortably "
Enjoyed our stay at Beachside Colony Resort! Only thing they had the pool closed for almost the whole day! But, overall we will stay there from now on!" OUR FAMILY HAS BEEN STAYING AT BEACH SIDE FOR 6 YEARS NOW. THE SERVICE AND ROOMS HAVE ALWAYS BEEN UP TO PAR. EASY ACCESS TO BEACH AND FOOD." I was unsure of the check-in process as the email confirmation didn't say where to go to check in. We figured it out and check in was easy but the lady was not friendly. I think the condo is spacious and the layout was good. I was extremely disappointed in the condition of the condo. Obviously the kitchen has been updated and looks great. However, the bathrooms were dirty. There is mold around master shower and the baseboards all appear to have water damage. The bed in the 2nd bedroom has something wrong with it. It is rickety and creaks every time you move. The pools were okay but I personally was shocked at the number of people who smoke at the pool. I felt like I was at a bar. Overall I was disappointed with this property." The unit was dirty. It had blood on the wall, dust and filth everywhere, the dishes were dirty, the chairs in living room area were dirty and torn. The bathroom vents had fuzzy lint all over them, one tv didn't work and the main tv buzzed constantly. The curtains were nasty. I will never stay there again. I will not recommend this facility to anyone. We paid 1800.00 and it wasn't worth 8 dollars a night"
Mar 24, 2016 - Deana M., Paragould, Ar. Two couples came for a long weekend, we loved the beachy-but-not-overkill condo. We love the location of Beachside Colony, never got in our car the whole weekend. Great mini-vacation!" I really liked the property but was disappointed at the condo we rented. There were no closets and kitchen was not fully equipped. Such as 1 wine glass, not a full set of dishes ( not plastic) We only stayed a few days but if we had stayed a week it would have been hard to cook. Unit could sleep six but only 3 chairs on deck, furniture in living area seemed pretty dated. I would have liked a nicer unit but would consider another visit. " Check in was a breeze - like that. Location, beach, and beach access were good. I stayed in unit 121 (and basically everyone staying on the south end of the property) had to walk by the trash storage and dumpster for pool/beach access - I would make that a high priority for any renovation/improvement. The unit was fine but just borderline basic on some things. Plates and glasses seemed to all be in 4's which was OK since there were 4 of us until we invited a friend over for lunch. Also meant we were constantly washing everything by hand to avoid running a nearly empty dishwasher between every meal. The A/C kept up, but barely. Maybe it's oldish and getting tired? I would recommend considering upping the capacity especially on end units like ours that gain more heat.We had 2 bulbs out in the kitchen which is no big deal but cleaning/maintenance should be on top of that (might have happened right as we walked in - who knows.) I guess there might be an owner (owners) of the unit and we just rented for a period. The teeny tiny TV's just seemed a little cheap. Sand is always the bane of your existence once you get ff the beach. I am no nube and we banged shoes and rinsed feet at the pool deck but there is always that little bit that is stuck to clothes, etc. I would have appreciated a vacuum in the unit or a swimmer that I could have run over the floor every day or so just so I wasn't having to wipe more and more sand off my feet every night getting into bed. Overall small things in an otherwise good experience. I raise them in hopes of helping make the property/experience even better." Very clean, had everything we needed, plenty of space and great views of the ocean"
My overall experience at Beachside Colony was excellent!! I found the staff to be professional and courteous. The condo was well furnished and spotlessly clean. The pool and restaurant were both superior! I would recommend Beachside Colony to my friends." I was very impressed with the size and cleanliness of Beachside Colony. Service was great and it's located less than 100 ft from the beach. The kids loved the pool. We will be staying here again on our next trip to Tybee!" Already talking about going back next year. Excellent location. Low key area. Large beach, did not feel crowded. Pools are small but kids loved them. Only one was heated to a useful temperature when we were there. Missed trying the resturant on site, will try again next year. Room was nice, a little low on the utensils, but we bring our own supply with us just in case." Rental process was easy friendly. The property was not as clean as I like but it was roomy. Over all it was okay"
The area is a small town and close enough to Savannah for day trips. Ee took a wonderful kayaking trip with a local company and a Beach Ecology trip with Joe Richardson that was fabulous! We were disappointed with the actual condo we stayed in though. We had to ask them to clean it when we got there and later found out that many other things were broken and dirty. The pools were nice but there is no hot tub but you are right on the beach." Everything was great, but would definitely like more pillows on the beds to sleep and curtains in the bedrooms. The master has too much light at night and day shining in. We had kids that needed naps, so that would have helped a lot. Otherwise we had a great time. " 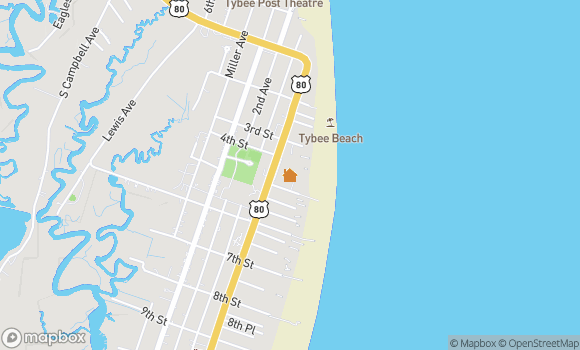 have been to Tybee several times. Each time stayed at Beachside Colony. Couldn't ask for better accommodations.Clean, right on the beach and convenient dinning. Thanks again." We would definitely stay at Beach Colony again. The condo was perfect, the pool area wonderful and of , the beach. The only disappointment was the microwave appeared to be on its last leg and only worked sporadically and the cable tv in the main living area wasn't working. I called, but received no response from maintenance. Here wasn't a television in the second bedroom, so my 78 year old mother went 3 days without TV, for the first time in a very very long time. " Relaxing vacation. Great food on the island!" Great location, beautiful view, and friendly staff!" The only thing that was disappointing was that there was no starter kits in condo as described on website. We had to buy laundry det, paper towels, tp, trash bags, sponge to wash dishes and no batteries in remote in bedrooms. No wireless Connectivity as described on website." "Excellent location, unit well worn. View from balcony was exceptional. Upon arrival our unit had pictures missing from the wall with nails still there, upholstery was in need of cleaning, a chest of drawers was missing from the hall, guest room mattress needs to be replaced (sagged in middle), and a pile of sand was in the hallway. We could live with that because we spent much of our time outside--only had one day of rain. Reserved for next year, but in a different unit." I love Beachside Colony! We have stayed here a number of times and I have never been the least bit disappointed. It is by far our favorite vacation destination." Oct 02, 2012 - Robin M.